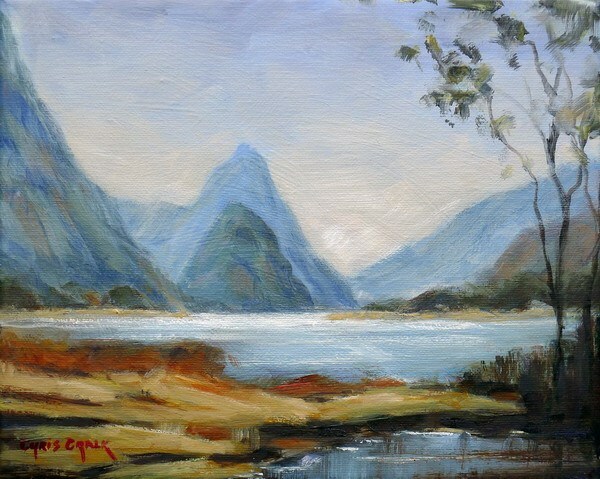 On a recent painting trip to New Zealand I was lucky enough to take a cruise on Milford Sound, and this is one of the works inspired by that magical place. The majestic mountain in the middle of the painting is Mitre Peak. Oil on canvas: 10" by 8"
Painted on Loxley Gold stretched canvas, 10 inch x 8 inch x 1/3 inch - This painting can be framed, or hung un-framed as shown.